Rachael Ray Hard Enamel Nonstick 10-Piece Cookware Set Just $95.99 Down From $245! You are here: Home / Great Deals / Amazon Deals / Rachael Ray Hard Enamel Nonstick 10-Piece Cookware Set Just $95.99! Down From $245! 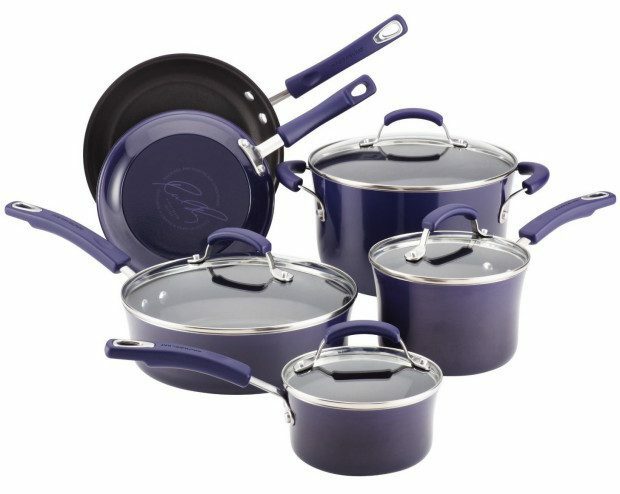 Rachael Ray Hard Enamel Nonstick 10-Piece Cookware Set Just $95.99! Down From $245! Check out this great deal on Amazon! Rachael Ray Hard Enamel Nonstick 10-Piece Cookware Set is just $95.99 down from $245! Get yours now before it’s gone! The rubberized dual-riveted handles are comfortable and oven safe to 350 degrees.